She did it all on her own. One night while heading up the stairs to go to bed, she said, " I want to sleep in Princess room." So we gave it a try and haven't looked back. It is so nice that she can get herself out of bed in the morning and come down when she is ready. And so far we have been really lucky... she doesn't get out much at night if at all. And the craziest part about it is, when we put her to bed she wants us to close her door! She was so excited to take pictures in her bed the next morning. We must have taken 20.
awww! She is really growing up! 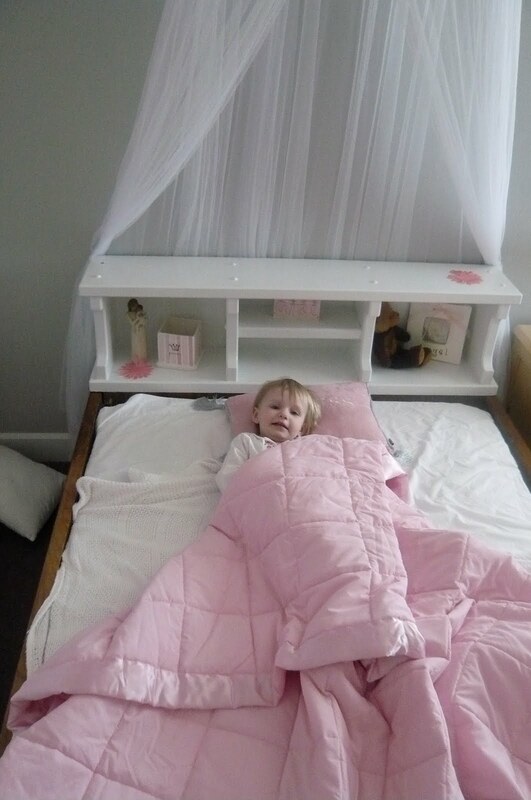 What a cutie pie in her big girl bed. Love you guys! Way to go Olivia! Looks like a comfy bed - I would want to sleep in there too!